Pyrrho (c. 360 B.C.E. - c. 275 B.C.E. 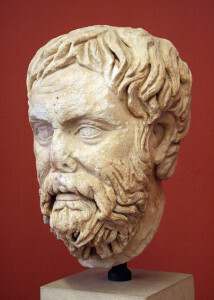 ), a Greek philosopher from Elis, was credited in antiquity as being the first skeptic philosopher and the inspiration for the school known as Pyrrhonism. His followers adopted the label "zetetic" (Greek meaning "seeker") and stressed the importance of observation and personal experience as a path to truth claiming that man can only know the world as it appears to him. This approach had a heavy influence on members of the Flat Earth movement of the 19th Century, many of whom adopted the label for themselves, forming the Universal Zetetic Society. Pyrrhonism is an ancient Greek philosophy of extreme skepticism. Pyrrhonists hold no dogmatic beliefs about reality, neither affirming that reality can be known or that it cannot: rather the Pyrrhonist says that investigation has so far not reached a conclusion and so judgement is suspended. It has originally been discussed in Aenesidemus's Pyrrhoneia. This page was last modified on 3 May 2014, at 15:40.